The new ERITECH® Mechanical Signal Reference Grid system allows for fast, simple and economical field construction of wire signal reference grids used in computer room grounding. In addition to cross-wire connections, each connector will also accommodate an additional pigtail that can be used to connect the grid to pedestals, building steel, and equipment. 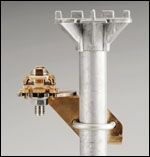 A raised-floor pedestal mounting bracket is also available to simplify retrofit installations. The UL® Listed product is also rated for direct burial allowing it to be used for below-grade equipotential mat and mesh construction. The connector will accomodate any combination of #4 or #6 solid or stranded conductors making it suitable for the majority of SRG applications. Mounting bracket will fit on round or square pedestals up to 1-1/8″ O.D. SRGC46 SRG Connector for #4 and #6 AWG solid or stranded conductor. SRGC46BR Pedestal mounting bracket for 7/8″ square or 1″ round pedestals.